For those not yet ready for school but eager to learn, a smattering of interactive titles show off their bells and whistles. 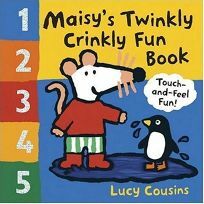 Lucy Cousins's omnipresent mouse counts from one to five in the paper-over-board, die-cut Maisy's Twinkly Crinkly Fun Book. Multiple textured accoutrements on each page include a bevy of furry animals, a gauzy tutu for Tallulah and a fuzzy sweater for Maisy. The straightforward text lists each number, followed by an action that creates a sound effect (e.g. ""Splish-splash"" as Maisy and Cyril engage in some ""crinkly"" puddle-jumping). .